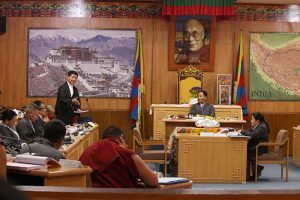 Dharamsala: Chaired by Speaker Mr. Pema Jungney, the third day of the 7th Session of the 16th Tibetan Parliament-in-Exile commenced with continuation of debate and discussion on 2019-2020 proposed budget of Department of Information and International Relations (DIIR) from the previous day with clarifications from the incumbent Sikyong Dr. Lobsang Sangay, Minister of Department of Information and International Relation and Mr. 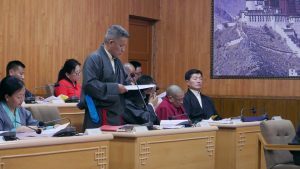 Karma Yeshi, Finance Minister against the doubts and questions raised by the concerned Parliamentarians, which continued until the session break for Lunch at 12:30 pm. The session resumed at 1:30 pm with continued debate and clarification on the 2019-2020 proposed budgets of Department of Information and International Relations, which was approved afterward. 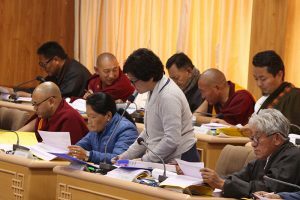 The session proceeded with debate and sanction on 2019-2020 proposed budgets of Tibet Policy Institute (TPI), Bureau of His Holiness the Dalai Lama, Indo Tibet Coordination Office (ITCO), Delhi, and Office of Tibet, Washington DC. Today’s session welcomed important guests, Mr Alex Ave-Lallemant, Regional Refugee Coordinator, Dr. Leah Pao, Deputy Regional Refugee Coordinator and Mr. Pema Tenzin, Refugee Program Assistant, U.S. Embassy, Kathmandu, Nepal. 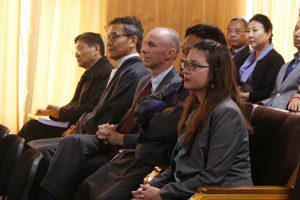 Mr Alex Ave-Lallemant, Regional Refugee Coordinator, Dr. Leah Pao, Deputy Regional Refugee Coordinator and Mr. Pema Tenzin, Refugee Program Assistant, U.S. Embassy, Kathmandu, Nepal. The house adjourned at 5:00 pm until 9:30 am of the next day.